After eight months “on the road” as it were, I’m back on my mooring pretty much full time now. I have to take the boat to Braunston on Tuesday to have the rest of my Webasto diesel central heating system fitted, and then a block of fourteen discovery days to do at the beginning of December. 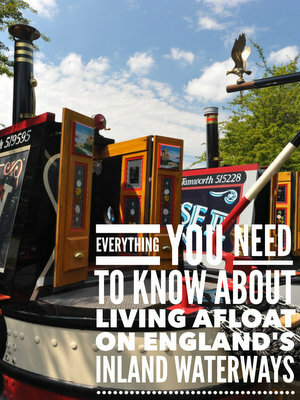 (The only day left is Thursday 10th December so if you want to experience life afloat in the winter you can join me if you’re quick by booking the date here.) After the discovery days I’ll be on my mooring until the end of March next year. I guess that many boaters wouldn’t like my mooring. I have a 62’ boat tied to a 36’ long rusting dump barge. If I want to get to the stern from the outside, I have to walk along my perilously narrow gunnels, reduced to just 2” wide when the original wooden cabin was over plated with steel, which are almost impassable in icy weather. The mooring is difficult to leave at the best of times. The prevailing south westerly pins the boat to the barge so I have to pivot the boat’s bow on the barge’s “bow” until my stern is pointing into the wind and then charge backwards into the middle of the marina before the wind blows my boat onto the narrowboat moored thirty feet behind me. For all its faults, the mooring suits me well enough. It’s in the north westerly section of Locks marina far away from other boats with an open view of the Grand Union canal off my starboard side and, usually, a wonderful view of the marine through my port side windows. Unfortunately I have no view of the marina at all at the moment. 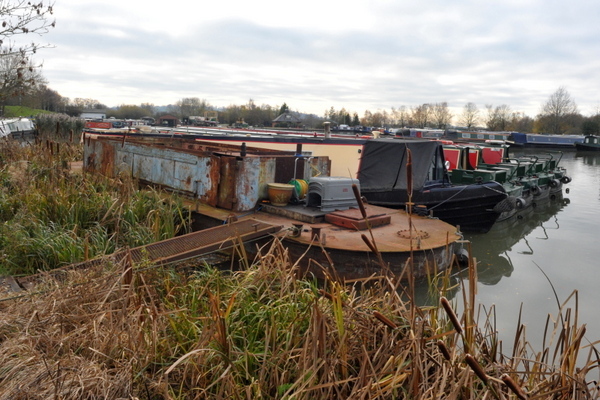 Part of my mooring agreement is that I share the dump barge in the winter months with the four 60’ long narrowboats owned by the Royal Navy and maintained by Calcutt Boats. When I left the marina to travel to Heathrow very early on Friday 13th November I had an open and unrestricted view of the marina. When I returned with Cynthia twelve hours later my floating home, from which I’ve enjoyed stunning views of rural England and Wales for the last eight months, was sandwiched between the dump barge and four other narrowboats. I suppose it was a fitting end to an already traumatic day. I’ll be back out on the cut for a week starting tomorrow. I’ll need a little help slipping the boat out of its sardine tin mooring before a pleasant two hour cruise to Braunston and Justin Greene. Along with a plumber friend, Justin will remove the three single radiators currently plumbed in to my stove’s back boiler then fit four new double radiators in their place. They will be connected to the Webasto Thermotop C diesel burner he fitted at the beginning of October. Once that’s done, and the Webasto is also plumbed in to my calorifier I’ll be free for five days until my first discovery day on 1st December. Unfortunately my discovery day guests won’t be able to meet Cynthia. Cynthia’s second visit to me on James wasn’t quite as relaxing or as enjoyable as her ten day cruise to Market Harborough in September. She barely had time to recover from thirty six exhausting hours travel on her outward journey before we both had to deal with the logistics of flying her back to the States again. After six hours detention at Heathrow terminal three’s immigration department, she was refused entry into the UK but was given a week’s period of grace before she had to leave. The airline which flew her to the UK, Virgin Atlantic, was duty bound to fly her back to her point of origin, Boston. Unfortunately Boston is a four hour drive from New York where Cynthia needed to go to try and fast track her marriage visit visa application. Thanks to the very helpful immigration case officers at Terminal Three we were able to book a flight with Virgin Atlantic directly to New York and at the airline’s cost. I booked another hire car, a much smaller car this time, with the wonderful people at Enterprise in Daventry at very short notice. Enterprise offer a first class service for carless boaters. Not only will they pick you up and drop you off at either end of your hire period, but they will also travel considerable distances to do so. The Daventry branch offer this service within a seventeen mile radius. After a 3am start on Wednesday morning we were back at Heathrow at 6am as instructed by the immigration department ready for the 8.50am flight. We had to telephone immigration as soon as we reached the airport so that they could give Cynthia the paperwork she needed for the check in desk. The immigration officer handed Cynthia a single form then left her with the instruction to phone again once she had checked in and completed all security checks. Unfortunately Virgin Atlantic had no record of Cynthia for the 8.50am flight so we had to call immigration again. Two of their officers joined three Virgin Atlantic staff for a twenty minute cross counter conference. Immigration claimed to have phoned Virgin to check availability then confirmed Virgin’s acceptance of Cynthia’s seat on the flight by email. Virgin denied all knowledge of the booking. The flight was full. Cynthia would have to come back another day. No she wouldn’t, immigration told Virgin, Cynthia would be leaving on the 8.50am flight so another passenger on the flight would have to be taken off. Apparently in matters of deportation, immigration outrank the airlines. Cynthia made the flight. Nineteen hours later Cynthia was still sitting in a visa agent’s office in New York. After paying a considerable amount of money to the agent for his services, and even more for the visa itself, she was still compiling the information needed for the application. At 8am she was back with the agent putting the final pieces into the complex jigsaw which is the visa application. After the indignity of having her fingerprints taken at Heathrow, she had to catch a train across New York to stand in a queue thirty people long to have them taken again. The application was submitted on Friday. All we have to do now is wait. One of the senior case officers at Heathrow immigration told me that, if you have to hang around for days on end, November isn’t a bad time to do it. It’s a quiet time of the year for marriage visit visa processing. People generally don’t want to consider making a move so close to Christmas. However, the process is going to be far from the one or two day processing we naively hoped for. The British Consulate in New York closes down for three days next week for their Thanksgiving celebrations. The application is more likely to take weeks rather than days which presented Cynthia with a bit of a problem. Before she left the States for her flight to the UK just over a week ago Cynthia closed down her life across the pond. She sold or gave away most of her possessions, shut up her house in Vermont for the winter pending its sale in the spring, sold her two vehicles and terminated her phone contract. She flew to New York with a carry-on bag holding enough clothes for a few days, a few mild autumn days at that. She’s now staying with a friend in rural Massachusetts while she waits for an email from the British Consulate in New York with the much hoped for details of her visa approval. So here I am, rattling around in far too much space on my boat again. The saving grace is that I have two wonderful but useless dogs to keep me company. 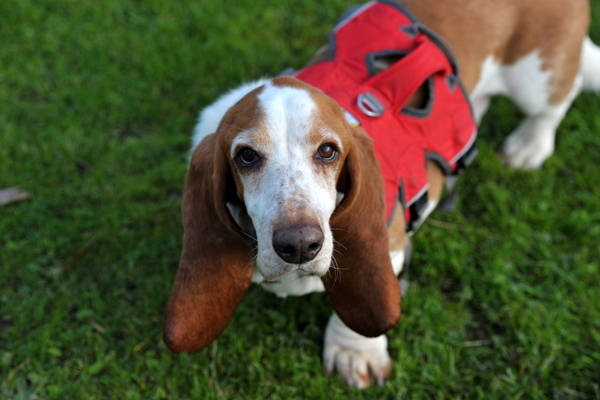 Basset hounds aren’t exactly the perfect boat dogs especially, if like six year old Bromley, they have neurological issues which mean that they fall over regularly and can’t jump at all. Both of them are just the right size and shape for pushing against doors to keep the draught out. Frustratingly, they are both far more interested in lying in front of the fire to keep the heat away from me. Both Bromley and ten year old Tasha have very sturdy chest harnesses so that they can be lifted in and out of the boat if necessary. 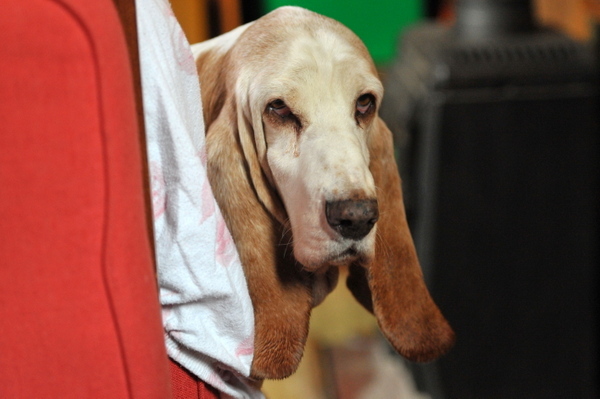 Tasha is the elder dog but doesn’t have any mobility issues. However, she has shown an unhealthy interest in the marina’s large and feisty cob swan. Clearly in America a very large water bird swelling its chest, spreading its wings and hissing loudly means, “Hello friend, why don’t you come here and play?” I don’t want her to discover the unpleasant truth the hard way so the chest harness’s sturdy handle allows me to lift her out of harm’s way. Bromley isn’t too steady on his legs. His balance is poor and he’s subject to occasional spasms which throw him to the ground. Usually he doesn’t seem to mind. He just shakes himself off, struggles to his feet and carries on sniffing and walking. Initially, watching him walk unsteadily across the metal walkway between bank and barge was a stressful experience, then I relaxed a little as his routine developed. He cautiously walked onto the metal bridge – like most dogs he doesn’t like being able to see througha walkway to water four feet below – tottered over the walkway until he was three feet from the end, and then rushed the final yard to safety. Inevitably, as soon as I was sure that he was safe crossing the bridge on his own he had a spasm and toppled towards the water. His harness handle saved the day. I was able to grab it as he disappeared over the side and haul him onto terra firma. I don’t want to risk him falling in and possibly hurting himself so I carry him, briefcase like, over any difficult obstacles which, for him, is anything taller than a blade of grass. If you have a clumsy or an older dog which isn’t too agile, these harnesses are a very useful tool. Neither of the dogs will be out of the boat when we are negotiating locks. They are hounds so pay far more attention to their noses than to human command. They’re far more likely to follow a wonderfully smelly scent than do as they’re told so they will stay inside when we need to focus on getting the boat safely through a lock. All too often I see owners trying and failing to control dogs at locks and not concentrating on the job at hand. It’s a potentially dangerous situation. So the dogs won’t be lock-side when we’re negotiating locks but they will see them very often when we take them out for walks. Bromley isn’t capable of negotiating a 12” wide lock gate on his own. The prospect of him having a spasm walking ten or fifteen feet above the unyielding concrete sill of an empty lock is too terrifying to contemplate. His harness carry handle will be used to quickly transport him from one side to the other without risk. Harnesses with handles are very useful for dog owning boaters. They can be used to safely carry reluctant or unsteady dogs over lock gates and they’re very handy for lifting accident prone or water obsessed dogs out of steep sided canals and rivers. Canals are often impossible for animals to climb out of on their own. The sides are often strengthened by vertical Armco style metal pilings or concrete. A good chest harness means that a potentially life threatening situation becomes just a mild inconvenience requiring a little brute force. Of course, how useful these harnesses are to you will depend on the size of your dog and your own ability to lift him. Bromley weights 17kg or 37lb in old money. A full bag of coal weighs 25kg/55lb so Bromley’s as heavy and unwieldy as three quarters of a bag. While I’m still young and fit – OK, just fit – lifting him like this isn’t a problem. To be honest, if I’m no longer able to lift a bag of coal I need to think about moving into a ground floor flat in a sheltered accommodation complex. Either that or strapping my anchor to my chest and jumping in to a lock. I think his chest harness will be fine for many years to come. Life’s trials and tribulations—the blissful five days Paul and I were able to spend on James went far too quickly, however we were able to accomplish a lot and found a nice rhythm of working together in a small space to which both of us are easily suited. All my worldly possessions fit into the capacious drawers and there was even an empty one left over! We put our heads together and came up with some more good ideas for proper storage as well as some redecorating options. I enjoy making small changes based on the seasons that help us to feel more comfortable. I brought a new red and white plaid duvet cover across the pond with me and it looks quite smashing on our bed, and makes for a welcoming and warm entrance at night! We are going to find a nice material that coordinates for the window dressings. If we can find quilted fabric, all the better—this will help keep the cold out. We are also considering new shams in the same fabric for the settee pillows. We spent a good deal of Sunday and Monday sorting out the immigration issues. Tiring and tedious to be sure! Paul has been a darling dealing with all this–he never loses his patience and focus. I couldn’t do it without him! We experienced a bit of an ordeal at Heathrow Wednesday morning, as Virgin told us the flight was full. Immigration stepped in and insisted they put me on. Once I hit the pavement in New York I went directly to the British Consulate and they said I needed to see a visa services agent in order to complete the extensive paperwork for the marriage visit visa. They were very accommodating and I couldn’t have done this without them. Paul had to submit a lot as well. We completed this Thursday afternoon and it was submitted yesterday. I just received an email and am keeping my fingers crossed it will be a faite à complet within two weeks. In the meantime I am staying with a dear friend in Massachusetts and doing my best to get by with what I have. Once again creative thinking and planning has enabled us to make it through this ordeal. And the silver lining here? I believe it has brought us even closer (if that is possible!) and we have proved to be a Great Team with a very positive attitude and no tension. We help each other out when one of us is a bit down and that is the way a committed long-term relationship should be, right?? Stay tuned—hopefully in next weeks newsletter I will have good news, and can return to my rightful place next to the love of my life…. Following his April Discovery Day, Australian Chris Smith sent me a sample of a water saving shower head, the LoFlo shower head he markets down under. The shower head needed an adapter before it would work with my shower, so he sent me that as well. I’ve now been using his shower head for a few months. It’s absolutely marvelous. Chris tells me that an average shower can use over twenty litres a minute. Having thrown my old shower head away I can’t verify his claim but I agree with his claim that the water saving shower head uses just five litres a minute when it’s dispensing water but one of the really useful features of this shower head is the trickle switch. The trickle switch helps save more water. You can turn the flow off at the showerhead while soaping up, without having to re-adjust the hot and cold taps to get the correct temperature. “Submarine” showers are a pain with mixer taps because you have to waste valuable water adjusting the temperature. 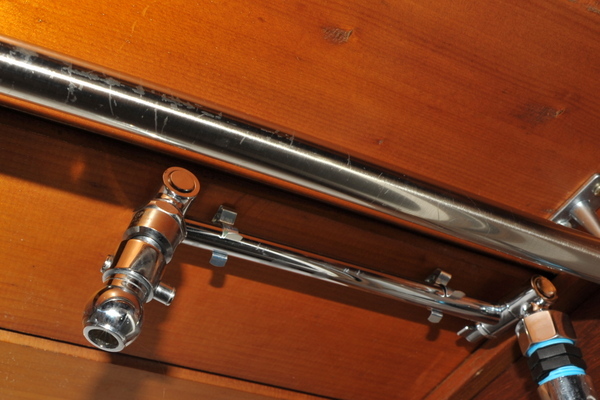 With the trickle switch you simply turn the flow off at the shower head without having to touch the taps. The last thing is that it really feels like a regular shower, whereas most low flow products simply reduce the flow and feel weak, and ladies find it difficult to rinse shampoo out of their hair. I imported a lady with hair all the way from Vermont to test it out. She was very happy with the end result. In fact, having spent many years living on a 35’ sail boat she was far more familiar with the submarine shower concept than me. The patented nozzle is non-clogging, with a large outlet. Most low flow shower heads use a small rubber o-ring to reduce the flow, and then a myriad of tiny hole in the outlet which are both prone to clogging. I am very happy indeed with this shower head. Not only does it save water, but it feels far more powerful than my old traditional shower head. If you’re interested in a high power low flow shower head for your boat, caravan or home, you can let Chris Smith know via email. Chris is currently arranging UK distribution. Two weeks ago I asked if you would be interested in seeing more video on the site. An overwhelming majority of those who responded (94%) said that they would. All that I need to do now is establish which the most popular subjects are. Over to you again. Here’s a list of video subjects requested in the survey. Please select all that interest you on the list. If you want to see something not on the list, please add your comments at the bottom of the survey. I look forward to reading what you’ve chosen for me.